This statement captures the essence of Cory Henry nearly perfectly. Quickly becoming regarded as one of the best Hammond organists of our generation, Henry encompasses the revival of tradition with a fresh new take. From his beginnings playing organ for his church to his recent successes with the two-time Grammy award-winning group Snarky Puppy, Henry has found joy in bringing jazz to the ears of young generations. His new project the Funk Apostles is comprised of musicians, all masters in their own right, who were carefully chosen to mold Henry’s musical passions into reality. The group includes Nicholas Semrad (keys), TaRon Lockett (drums), Sharay Reed (bass), Adam Agati (guitar), Denise Stoudmire (vocals), and Tiffany Stevenson (vocals). Departing from the contemporary jazz style of Snarky Puppy, the Funk Apostles dabble in gospel, R&B, and funk with new pieces as well as reimaginings of old classics. Henry and his group took the stage to loud applause, with some members of the audience already standing in excitement. When Henry spoke, his voice was soft, soothing, almost sleepy; a perfect juxtaposition for the explosiveness of his playing. 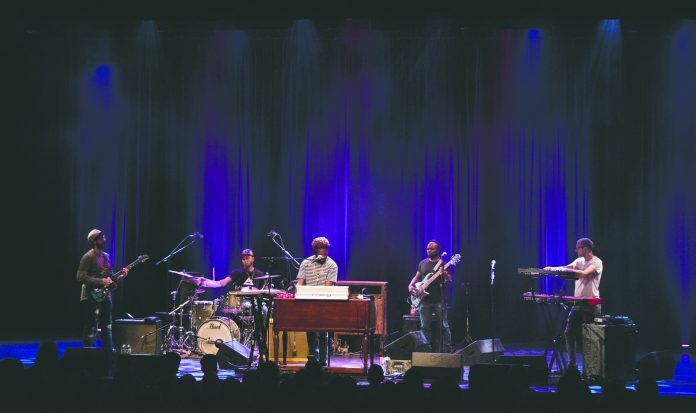 The Funk Apostles’ first song was a 15-minute long jam session that featured Henry’s improvisational genius on Hammond organ as well as synthesizer. His passion for music was such that even while improvising, he would jump and yell and flail about. Had the musicality been anything less than perfect his actions would have been comical, but the audience fed off his energy, and many members left their seats and began to dance in the crowded aisles of Campbell Hall. Henry’s second song was simple, and he urged the audience to sing along. It consisted mainly of one phrase: “I feel alright now!” with an intermittent bridge: “I feel good, and I knew that I would.” The entire show was brimming with positivity and good vibes, messages that Henry not only spoke about, but actively incorporated into his songs. The third piece of the night, entitled “Trade It All,” was a deceptively upbeat song that contained a deeply heartfelt message about the lengths Henry would go to for the person he loved. “In the Water” and “Our Affairs” both dealt with the turmoil of certain relationships, the possibility of getting swept away by the waves of love, and the question of why love makes us suffer. The following song, “Takes All Time,” was an upbeat reminder for the bachelors and bachelorettes of the crowd that finding love “takes all time” and looking hard doesn’t necessarily expedite the process. He finished with “Naa Naa Naa” from his 2016 album The Revival, which he called his “happy song,” instructing the audience to “keep singing it forever and ever, because it makes you happy in your heart.” Henry and his Apostles then stepped off the stage, thanking the audience and waving goodbye. The crowd would not let Henry and the Funk Apostles leave. The hall was soon filled with the chant, “One more song!” and after a brief absence, the Funk Apostles took the stage once more, playing their encore piece “Controversy,” which contained a message advocating that we are all the same in the end. Henry finished strong, inspiring members of the crowd to gather around the stage, dancing and jumping. Campbell Hall was bursting with Henry and the Funk Apostles’ positive energy and message the entire night. The groove was infectious, and the overall theme instilled joy and camaraderie even among total strangers.